A new paper appearing in the Proceedings of the National Academy of Sciences (PNAS) by a team of researchers that includes University of Notre Dame ecologist David Lodge suggests that people, governments and institutions that shape the way people interact may be just as important for determining environmental conditions as the environmental processes themselves. “Tipping points,” qualitative changes in an ecosystem that often result in reduced ecosystem health and are difficult and costly to reverse, increasingly concern environmental scientists. The prevailing assumption among scientists has been that tipping points are fixed values. 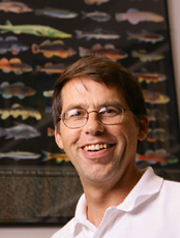 However, a unique research collaboration involving a team of biologists and economists that included Lodge, Michigan State University economist Richard Horan, Arizona State University economist Eli Fenichel and Bethel College biologist Kevin Drury, indicates that these tipping points are not fixed in human-impacted ecological systems and depend, instead, on human responses to a changing environment. The authors point out many instances of tipping points that resulted in catastrophic changes in ecosystems, such as climate change, collapsed freshwater and marine fisheries and changes wrought by invasive species. For example, the invasive species sea lamprey changed the Great Lakes from an environment productive of lake trout and whitefish to a collapsed fishery. If not for the $17 million spent annually by the United States and Canada to control them, sea lamprey would continue to devastate Great Lakes fisheries. In the research described in the PNAS paper, the researchers studied invasive rusty crayfish, which have transformed many Michigan and Wisconsin lakes from luxuriant underwater forests inhabited by many smaller animals that supported sport fish to clear-cut forests with diminished production of sport fish. This outcome occurred despite the fact that there are many fish like smallmouth bass that readily consume crayfish. The institutional rules shape the relationship among managers, users and ecological systems. If the system is mapped using only ecological characteristics, then managers may not account for human responses to change, such as changing decisions about whether or how much to fish as fishing quality changes. The research results showed that tipping points in human-impacted ecosystems are affected by regulatory choices that influence human behavior. “This gives us reason for optimism: if we give regulators sufficient flexibility it may be possible and cost-effective to manage ecological systems so that only desirable ecological outcomes arise and tipping points are eliminated,” Horan said. ”Our results also create concern: if natural resource managers’ policy choices are overly restricted, then it might be too difficult or costly to avoid tipping points,” Fenichel added. In particular, the researchers stress that their results highlight the importance of giving strong institutional support to regulatory agencies that aim to enhance societal well-being.